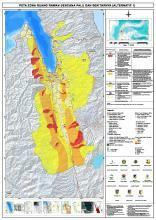 This is a draft zoning map based on assessments on earthquake, tsunami, and liquefaction risks in Central Sulawesi. The Red Zone is Prohibited Zone. The Orange Zone is Limited Zone.